EFFINGHAM, ILLINOIS – October 11, 2016: Hodgson Mill Inc.is upgrading and replacing their existing two wind turbines with a sleeker, more modern, efficient and powerful style. Beginning Oct. 11th, local Central Illinois firm Midwest Green Energy, LLC is dismantling and removing the old vertical turbines and over the next month will install new helical turbines. The installation is at Hodgson Mill’s main production facility in Effingham, IL. The original vertical axis wind turbines (photo, top right) were installed in late 2010 by Midwest Green Energy. These turbines were 18’ wide and 20’ tall with five vertical blades to catch the wind. “We have had some trouble with the old design, which required maintenance and attention - we had to manually shut it off if wind speeds rose over 15mph to avoid damage,” reports Bob Goldstein, Hodgson Mill President. 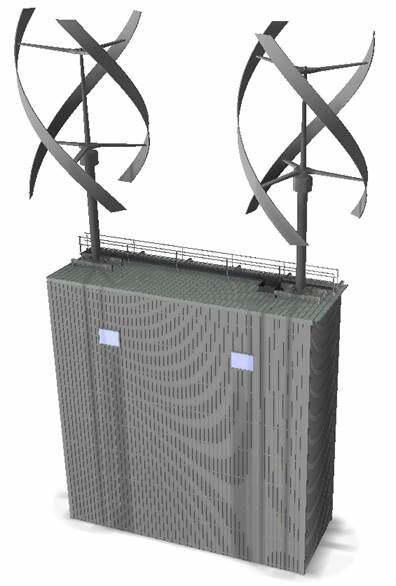 The new helical wind turbines (rendering, bottom right), on the other hand, are more efficient and less prone to damage, and they are larger, at 21’ wide and 31’ tall, with a sleek corkscrew shape. They will automatically slow to adjust to winds above 12mph to avoid damage, and are designed to last indefinitely with little required maintenance. Each helical turbine’s max energy output is 14,500 kWh/year –more than enough to power an average US household’s yearly usage (10,932kWh). The new helical turbines are also about double the weight (4000 kg or 8816 lbs each) so the building superstructure must be reinforced before installing the new turbines, which is planned for early to mid-November 2016. Wind power is part of Hodgson Mill’s commitment to sustainability, which includes a robust recycling program where 99% of material waste produced during manufacturing is recycled. Hodgson Mill has also invested in 4 solar pole mounts (with 16 solar modules per pole) which automatically track the sun’s path. Hodgson Mill is a family-owned company passionate about making high quality, whole grain foods at a reasonable price – because good food is for everyone. Proudly located in the heart of the Midwest, we stone-grind whole grains the old-fashioned way with North Carolina pink granite millstone to create flours, corn meals, baking mixes, hot cereals, pastas, and sides. Hodgson Mill welcomes media inquiries about this exciting project - please call us at 800-525-0177 with questions or requests for photos, interviews, or footage.